Between April 1 and 22, the Embassies of Belgium, France, Egypt, Greece, Hungary, Lithuania, Morocco, Mexico, Romania and Switzerland will jointly celebrate French language and Francophonie holiday. On the occasion of the 60th anniversary of the death of the Romanian sculptor Constantin Brâncuși, this photo exhibition looks back on the life and work of the artist. Created in 2007, Le Carrefour remains to this day the only newspaper written in French language in Azerbaijan. A brief analysis of the influence of French culture following the independence of Mexico; its positioning against Spanish and British influence in the middle of the nineteenth century and how it increased during the first decade of the twentieth century. Kevin Crupi and Yoann Roig, from the Swiss sport association « X-Trem Move » of Lausanne (Switzerland) will give a Swiss Master Class of parkour & freerun at the Azerbaijan State Academy of Physical Culture and Sports. Students will learn basic techniques for jumping on and acrobatically traversing through obstacles in an athletic and elegant way. Dinel, Sile and Pompiliu are three men from a provincial town in urgent need of money. They decide to buy a lottery ticket and win, but soon after their ticket is stolen. Watch their journey as they try to find it. Alone or with friends, join us in a joyous and relaxed atmosphere to test your knowledge on the French language and countries of the Francophonie through various rounds. The winning team will take home Fireland wine ! Reservation before April 3, 25 manat ($14), buffet included. All day long, animation on Belgian literature, music or cinema will be presented at the Institut Français. Yoann & Kevin will perform a spectacular parkour open air show together with two members of the Gilavar Extreme Sports Club, Mr. Mammadzada Hasan and Mr. Gurbanov Ayaz. Watch as they perform in this amazing scenic location, the UNESCO protected historical site of Icheri Sheher (Old City), just in front of the Maiden Tower. Icheri Sheher, in front of the Maiden Tower. This film tells the story of the 14th Century Moroccan explorer Ibn Battuta's pilgrimage from Tanger to Mecca. 11:00 OPENING OF THE 15TH INTERNATIONAL CHESS TOURNAMENT FOR YOUTH, organized by Ganclik club. 42 young chess players from Azerbaijan, Kazakhstan, France, Russia, Ukraine and Israel will come face to face. The winner will receive a trip to France to participate in the Youth chess tournament in Metz. Four European Chefs gather in one kitchen to offer to guests a unique gourmet experience. With the participation of Thibault BERA, from Paris Bistro (France), Franco QUIQUE from El Portalon (Spain), Giovanni TAVOLARO, from Tosca (Italy) and Dani ALAM, from Movida (Lebanon). Documentary film on the life of one of the most important Hungarian football players, Ferenc Puskas. Many periods of Hungarian history have been shaped by coexistence and interchange with eastern peoples. Many Hungarian explorers travelled through Orient. This exhibition shows the most famous of them, their lives and works. Alone on stage and with his voice as the only ally, Felix Libris presents The Miser in one hour. There is neither decoration nor accessories, nevertheless, everything seems to be there: intensity of the emotions, virtuosity of the characters, elegance and the humor of the verb. The characters - Harpagon, La Flèche, Mariane, Valere, Elise, Cléante, Frosine, Master Jacques, etc. – are brought to life in turns in this rhythmic and passionate show. The result is stunning. Alone on stage and with his voice as the only ally, Felix Libris presents The Miser in one hour. There is neither decors nor accessories; nevertheless, everything seems to be there: intensity of the emotions, virtuosity of the characters, elegance and the humor of the verb. Felix Libris will explain the tricks of the Solo show. Training for professional actors. „Archi.realities – Egypt” is a look towards different layers of Egyptian realities through architecture as well as visual representations of personal experience of daily life in this country. 19:00 Opening of the exhibition “Egypt in the Eyes of Children of Azerbaijan"
Exhibition of pictures created by Azerbaijani children aged 6 to 16 about Egypt, its civilization and its culture. With the participation of the Ambassadors of the ten participating countries (Belgium, Egypt, France, Greece, Hungary, Lithuania, Morocco, Mexico, Romania and Switzerland). Francophone buffet provided by the Embassies. Each Embassy will have a stand, presenting culinary and cultural specialties from their countries, offering guests an opportunity to taste the cultural wealth of the francophone world. - 3-4 April, Mr Mohamed Ketata, Director of the Central and Eastern Europe Office of the Academic Agency of Francophonie, will visit the Azerbaijani Universities. - Thursday 6th April, students of French language at the University of Languages in Azerbaijan will present a show of The Miser, by Molière. 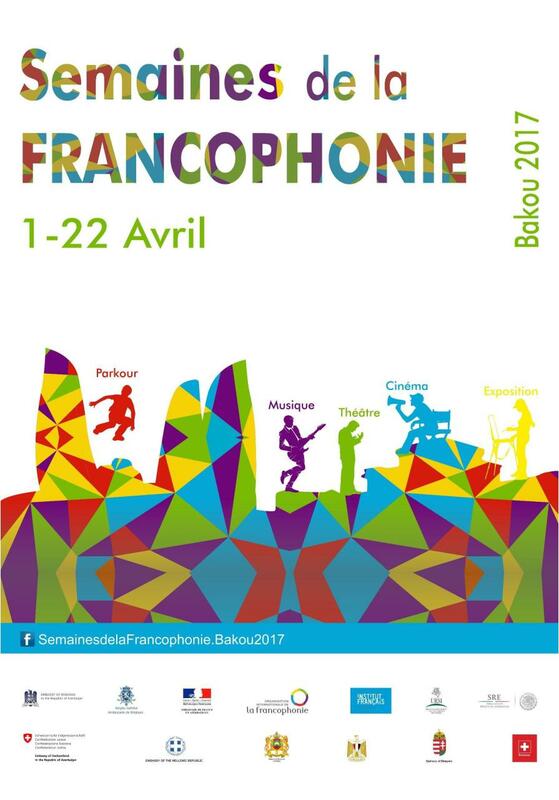 - Thursday 20th April, 14:00: Francophonie Show presented by students at the University of Languages in Azerbaijan. - Throughout the month of April, UFAZ students will present theatrical, poetic, or musical performances around La Francophonie within their University.